Do you require a filling? In the past having a filling meant that you would be always smiling with a silver sparkle. Now with the development of resin and ceramic restorations all fillings can be completed ensuring that they go unnoticed without compromising on strength. Ideal for small to medium restorations, tooth coloured fillings also known as resins or composites are available. This type of restoration is hard wearing and can be placed during one visit to our practice. During this visit we will carefully prepare your tooth’s surface to receive this resin material. This is done by removing any decayed portions, ‘etch style’ cleaning and application of a special dental bond so that the resin seals correctly. The resin itself is a pliable material and this is added incrementally to your tooth and then set with a blue light. Once the material is set, it is carefully shaped so that the contours are matched perfectly to your neighboring and opposing teeth. 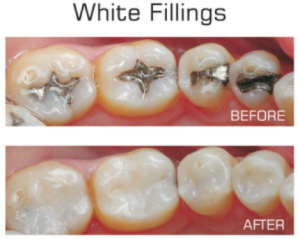 Inlays and onlays are essentially larger fillings that are fabricated from ceramic. These are also known as an indirect form of restoration (they are fabricated outside the mouth) which is cemented using specialised dental cement. This may be done in one or two visits depending on your tooth. They are used to repair moderately damaged back teeth, and are able to withstand grinding and biting pressure, especially toward the back of your mouth helping to reinforce your remaining tooth. Ask your More Smiles dentist which would be most suitable for you.